To database is available in two versions. 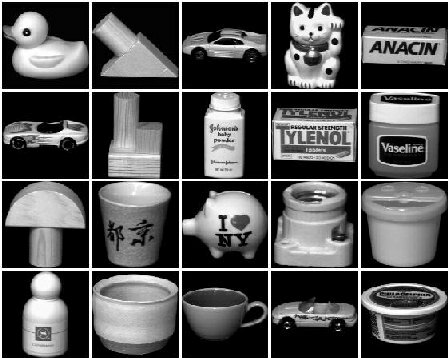 The first, [unprocessed], consists of images for five of the objects that contain both the object and the background. The second, [processed], contains images for all of the objects in which the background has been discarded (and the images consist of the smallest square that contains the object). For formal documentation look at the corresponding compressed technical report, [gzipped]. "Columbia Object Image Library (COIL-20),"
Technical Report CUCS-005-96, February 1996.